Here at Giggle Life we are firm believers that cloth diapers are the best way to go for diapering because they are better for the environment, better for the baby's health, and they will save you money! The quality of our cloth diapers are among the best and we are also one of the most affordable brands because we use a direct to consumer approach. Our goal is to build awareness and make cloth diapers affordable enough that they become the primary choice for diapering. 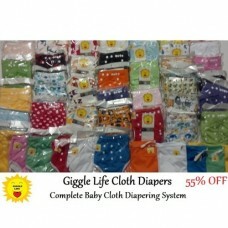 The Giggle Life Complete Baby Cloth..